The STUN server stun.ekiga.net has a new location. We have updated the DNS servers but it will take time before the new IP address is used everywhere, and the new server is having problems. If you have problems registering to ekiga.net or doing calls, and if you are using STUN, we suggest you to use an alternative STUN server like stun.voxgratia.org for example. Update: The STUN server is back. We have released an updated version of Ekiga 2.00. This version fixes a problem with the retransmission of SIP messages. It also fixes an installation problem due to a missing gnome-doc-utils.make. We recommend upgrading to 2.0.1. Ekiga 2.00 aka "The Oberoi Release" available! After more than one year of work, Ekiga 2.00 is finally available. Ekiga is now the first Open Source software to support both SIP and H.323 in the same application. GnomeMeeting was already a pioneer among the Open Source Voice over IP softphones, and we hope that Ekiga will continue in this path. Ekiga 2.00 BETA 2 released! Ekiga 2.00 BETA 2 has been released after one month of hard work to improve the previously released BETA 1. 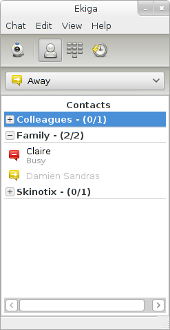 Ekiga 2.00 BETA 1 already had a big success and received very good reviews among VoIP users. We hope to be able to offer the best vendor-independant and Open Source VoIP softphone. Don't hesitate to report problems! GnomeMeeting has been renamed Ekiga, to be pronounced [i k ai g a]. We have also released the first BETA of the upcoming 2.00 release on http://www.ekiga.org. Both websites will be merged when we release the 2.00 in February. The new slogan of GnomeMeeting will be "Free Your Speech" as announced more than one month ago on the devel mailing list. We have decided to change the slogan of GnomeMeeting to emphasize on the fact that GnomeMeeting is not only free like free beer, but mainly free like free speech. We are only working with standard protocols, standard codecs, and have no relationship with any company having commercial interests in the project. Seconix.com has hardware problems and is down. OVH has kindly donated a server and bandwidth to host my blog and the various GnomeMeeting services that we plan to deploy in the future with the SIP version.